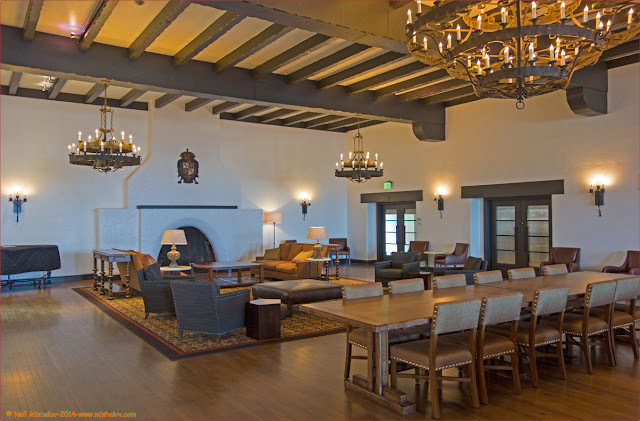 I read that the Presidio Trust would be opening the Presidio Officers’ Club on 7 October 2014 as a showcase for illuminating the rich history of the Presidio. 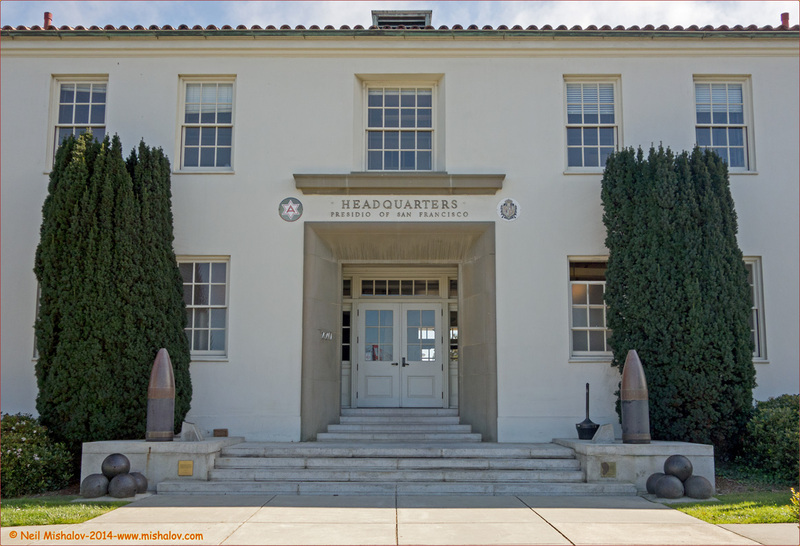 “The Presidio was a military post for more than 200 years, first for Spain in 1776, then for Mexico in 1822, and finally for the United States Army from 1846 to 1994.” Today the Presidio is a National Historic Landmark. I decided to visit the Presidio Officers’ Club and see the exhibits. I walked to the Presidio from the Montgomery Street BART Station. This map illustrates the route traveled, with mile markers shown. 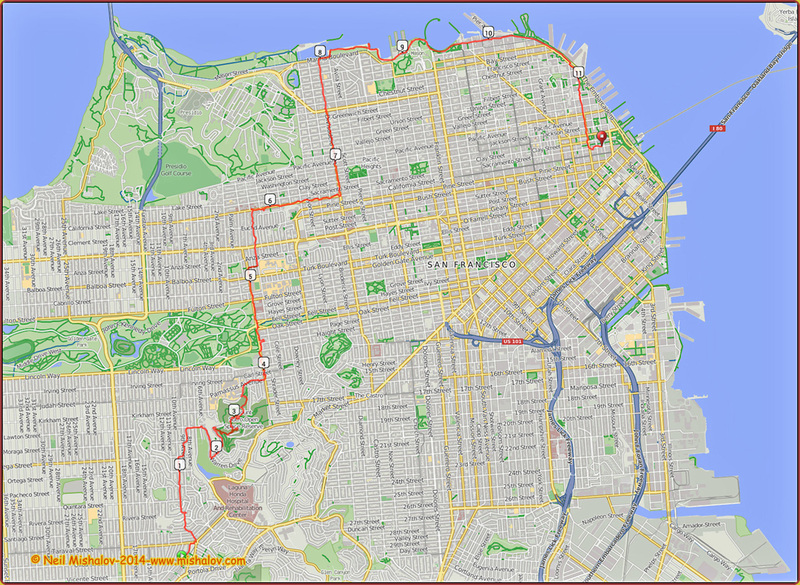 The approximate distance traveled, as measured by a GPS receiver, was 10.9 miles. Click on the image to see the full-size map. This graph shows the elevation changes encountered during the ramble. The approximate cumulative elevation gain was 805 feet. Click on the image to see the full-size chart. 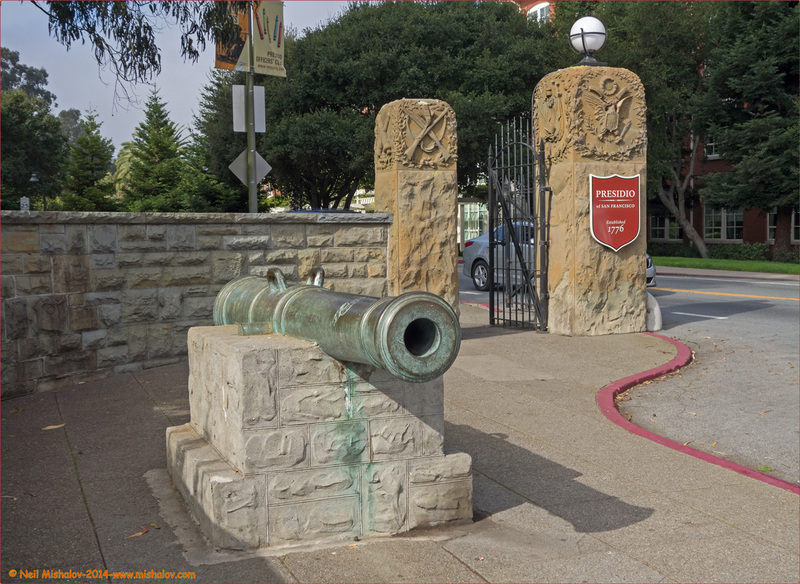 A view of the Presidio’s Lombard Street gate. 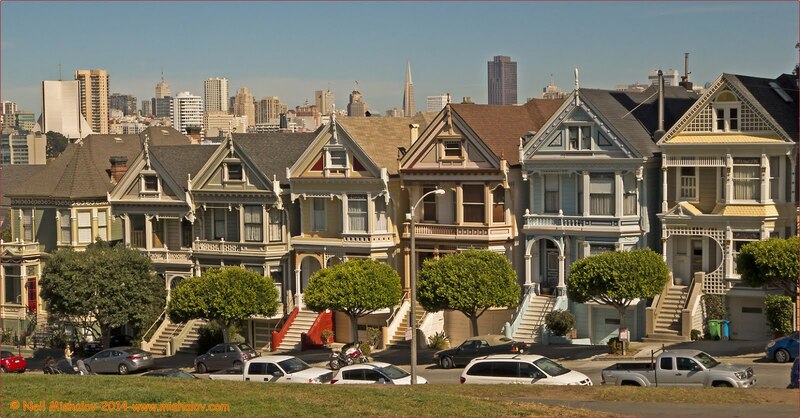 The picture was taken during World War II from an apartment building located across the street from the Presidio. 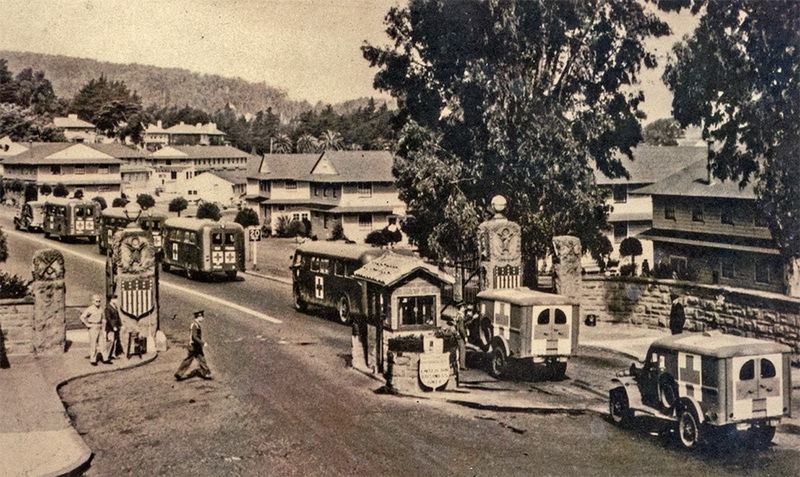 The convoy of ambulances traveling to Letterman Army Hospital is a grim reminder of the carnage that was taking place during the war. The hospital treated 73,000 patients from the Pacific Theatre of Operations in 1945 alone. 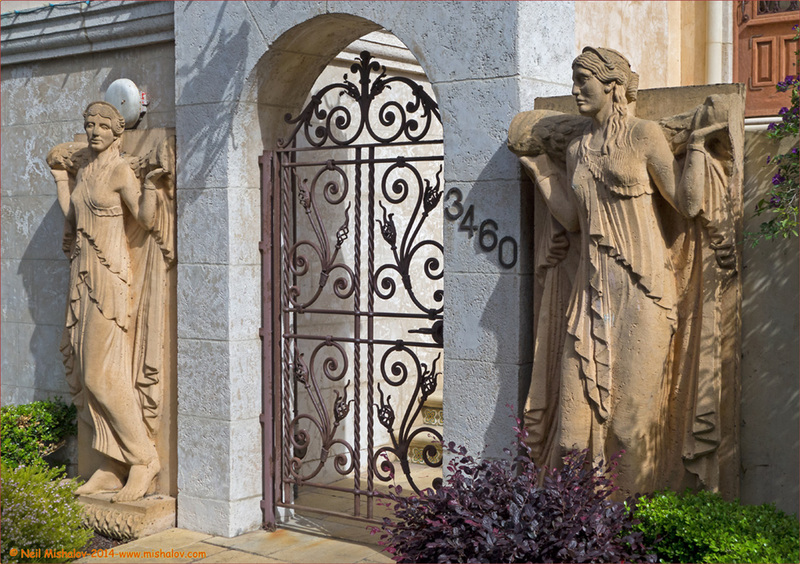 A present day view of the Lombard Street gate. Click on the image to see the full-size photo. A view of the 6th Army Headquarters building. Click on the image to see the full-size photograph. 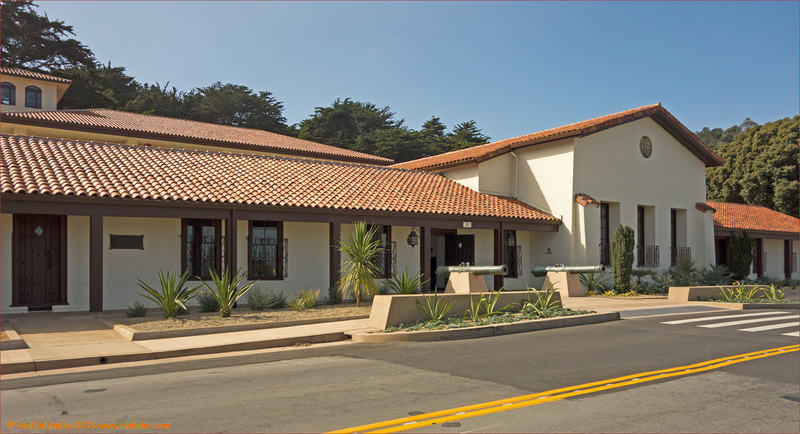 A view of the Presidio Officers’ Club building. Click on the image to see the full-size photo. 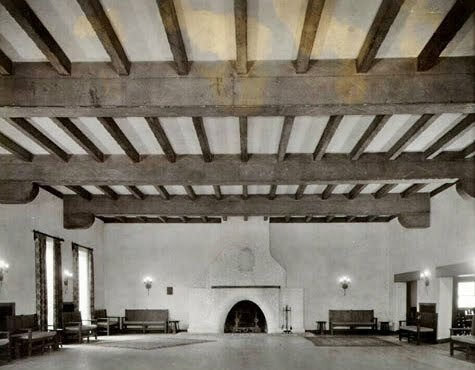 A view of Moraga Hall, which is located in the Officers’ Club. Click on the image to see the full-size photograph. A photo of Moraga Hall taken in 1934. This flagpole has a sad history. 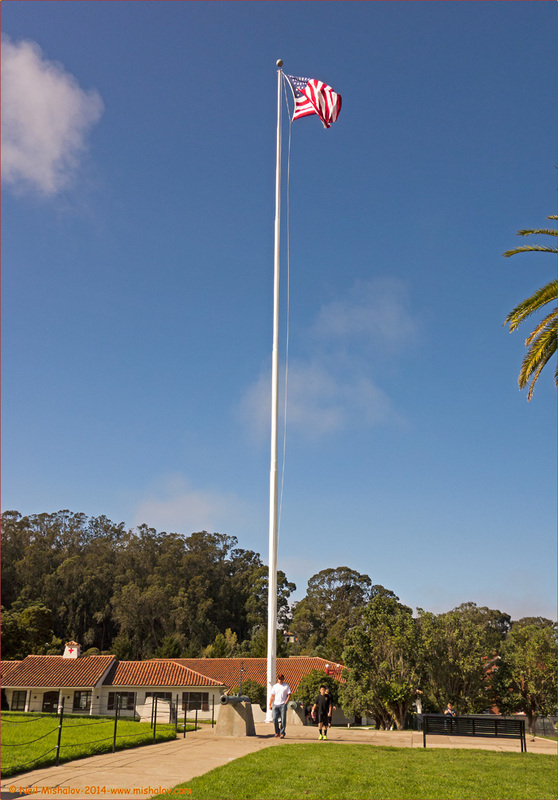 The 2¼ ton, 105½ foot flagpole is the tallest in the San Francisco area. 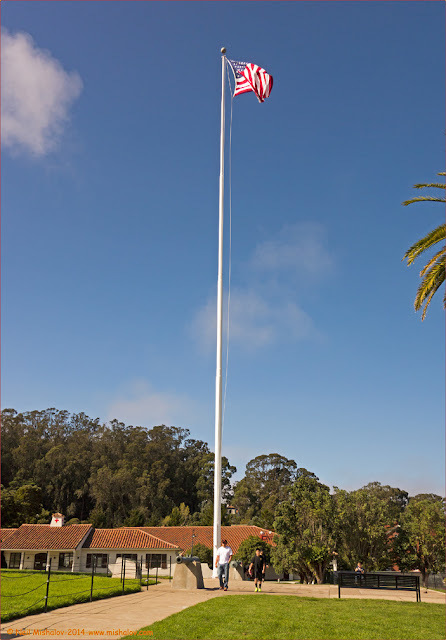 The flagpole marks the site where General John J. Pershing (1860-1948) his wife, his three young daughters and his young son lived in government housing befit a General. On 13 January 1914, General Pershing took command of the 8th Infantry Brigade at the Presidio of San Francisco. It wasn’t long, however, before tensions along the Mexican border forced the 8th Infantry to be transferred to Fort Bliss, Texas. 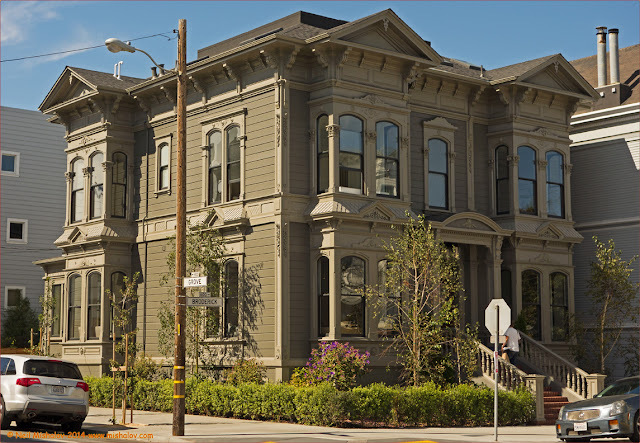 While her husband was at Fort Bliss, Mrs. Francis Pershing, and the four children remained at the family’s two-story Victorian house at the Presidio. Tragedy struck on Friday 27 August 1915, when hot coals spilled from the hearth of the Pershing home and onto the highly waxed floor. The house was quickly consumed by flames; Mrs. Pershing and her three daughters—Helen Elizabeth, aged eight, Ann Orr, aged seven, and Mary Margaret, aged three—perished in the blaze. Only five-year-old Warren survived after being rescued by Pershing’s orderly. The General’s wife and three daughters were buried in Montana. After the funeral, General Pershing returned to Texas accompanied by his son and his sister. Warren, General Pershing’s only surviving child, served in the Second World War as an advisor to Army Chief of Staff General George C. Marshall. Warren Pershing (1909-1980) attained the rank of Colonel. He had two sons Richard (1942-1968) and John (1941-1999). Richard was an Army Second Lieutenant, who was killed in action in Vietnam on 17 February 1968. John attained the rank of Colonel in the Army. He died of cardiovascular disease in 1999. Click on the image to see the full-size photo. The house the Pershing family lived in while at the Presidio. This picture shows the remains of the house after the deadly 27 August 1915 fire. 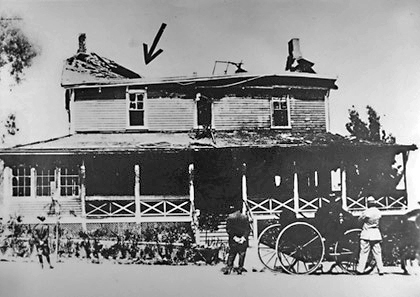 Pershing’s five-year-old son Warren was the only child to survive the blaze; he was rescued through the window indicated by the arrow. 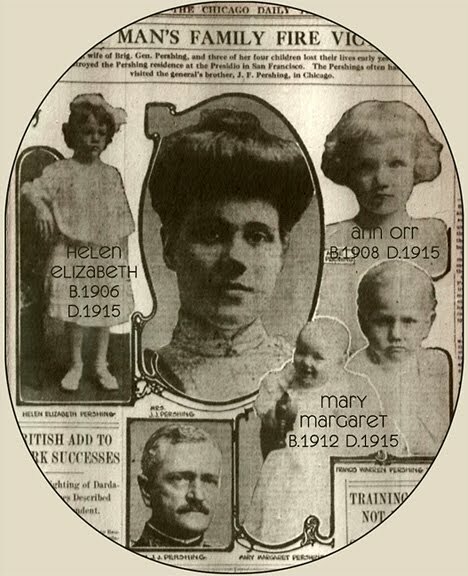 A snippet of an article about the tragedy published by the Chicago Daily Tribune on 28 August 1915. 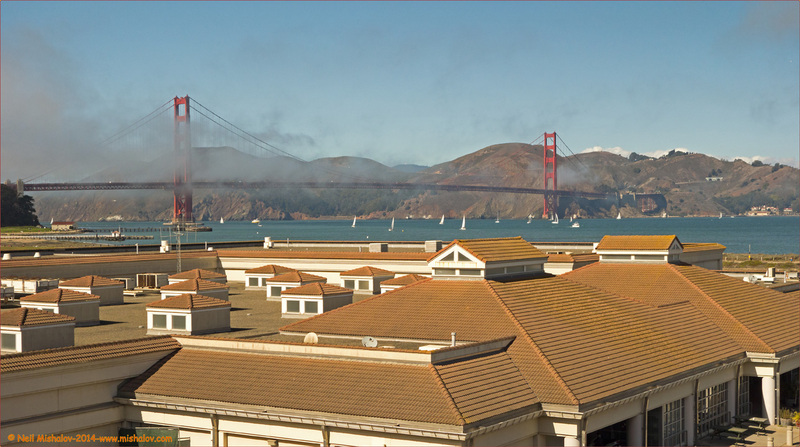 A view of the Golden Gate Bridge as seen from near the Presidio’s Main Parade Ground. The building in the lower portion of the photograph was the post’s main commissary. Click on the image to see the full-size photograph. 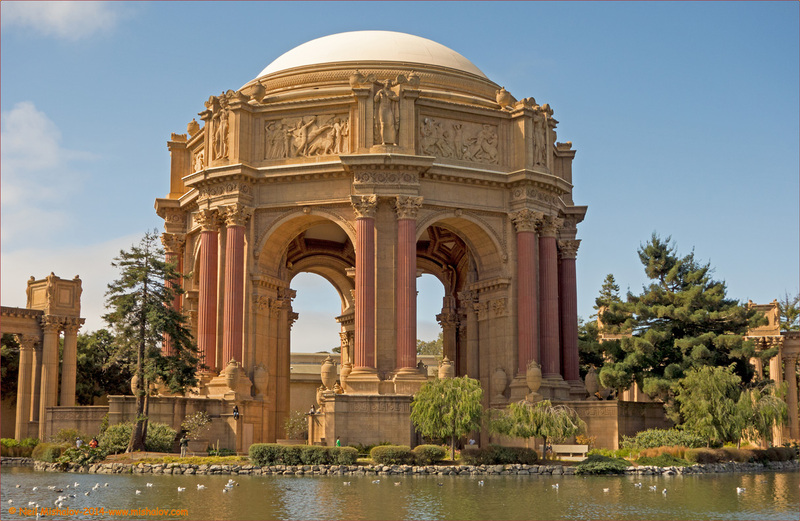 The Palace of Fine Arts was constructed for the 1915 Panama-Pacific Exposition. The Palace of Fine Arts was designed by the esteemed architect Bernard Maybeck (1862-1957). 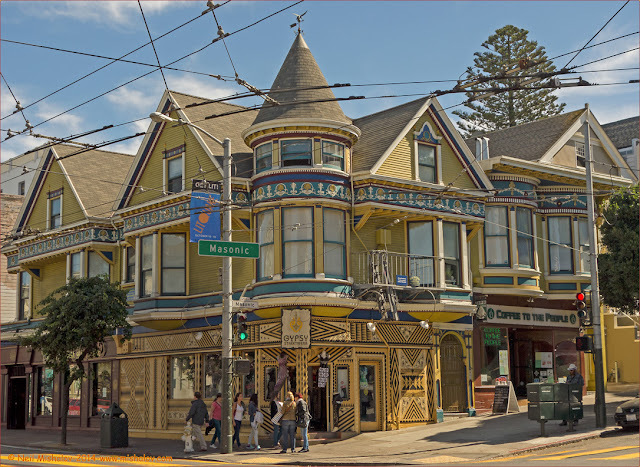 Professor Maybeck moved to Berkeley, California in 1892, and was a professor at the University of California, Berkeley. Click on the image to see the full-size photo. A detail from the Palace of Fine Arts. Click on the image to see the full-size photograph. The entryway to 3460 Baker Street, a private home. 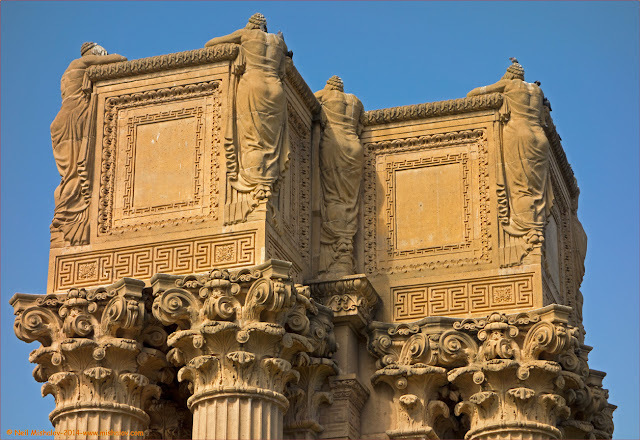 It is sited directly east of the Palace of Fine Arts. Click on the image to see the full-size photo. 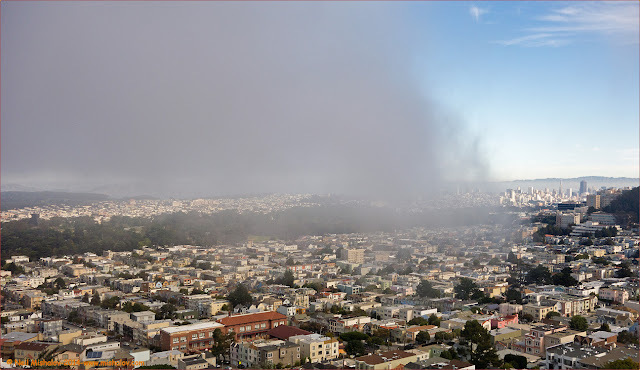 It is now late afternoon, and the fog is barreling in through the Golden Gate. The view is looking North. The buildings on the hillside across San Francisco Bay are homes in the community of Sausalito. The mountain directly ahead is majestic Mount Tamalpais (2,572 feet). Click on the image to see the full-size photograph. 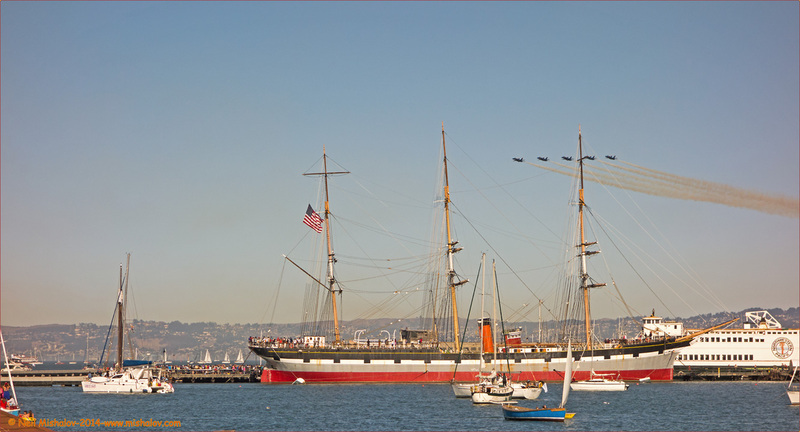 The Navy and Marines participated in San Francisco Fleet Week. There was no Fleet Week event in 2013 because the Federal Government decided to pare expenses. 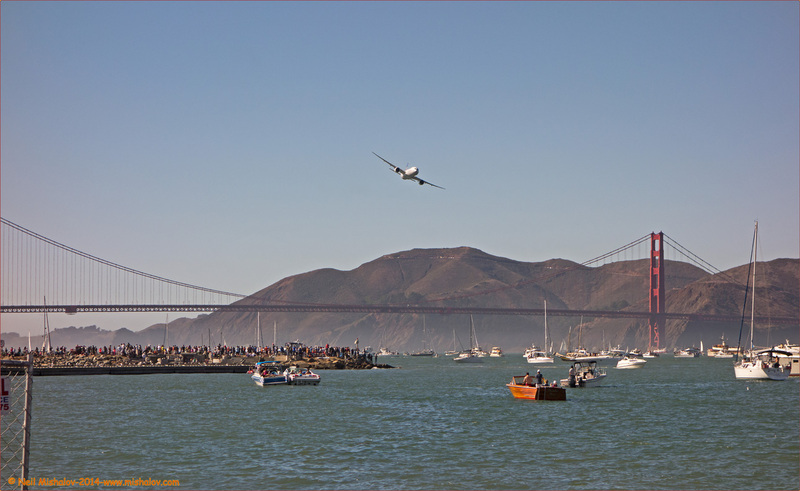 I have been going to Fleet Week over the years, and it has always been an enjoyable event. Here are some pictures I took while at Fleet Week 2006 and here are some pictures I took while on a cruise on the SS Jeremiah O’Brien during May 2003. The Jeremiah O’Brien is a Liberty Ship, and she is docked in San Francisco. 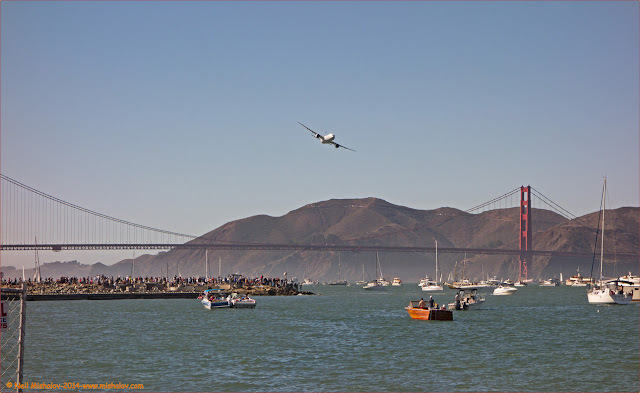 This year I decided to cover more ground before I arrived at the San Francisco Marina to view the Blue Angels do their fabulous close quarter acrobatic flying. 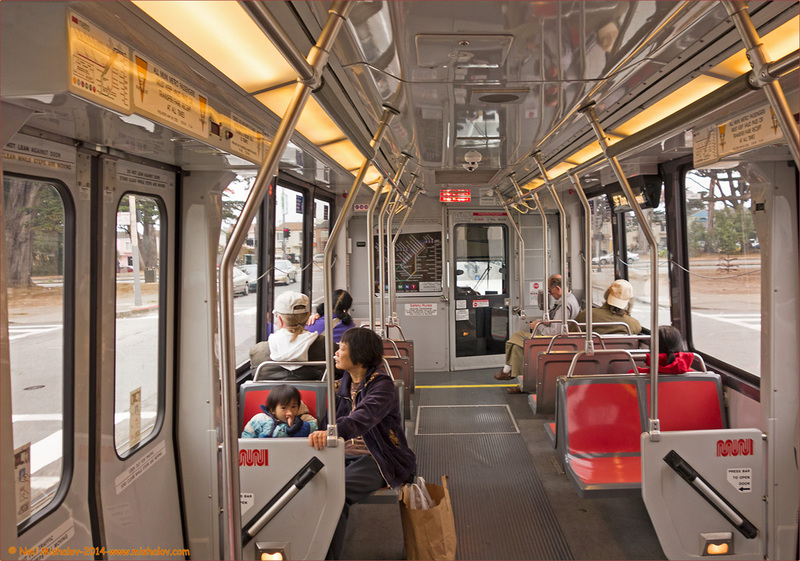 I took the Muni Metro to the West Portal Station and began my trek from that location. 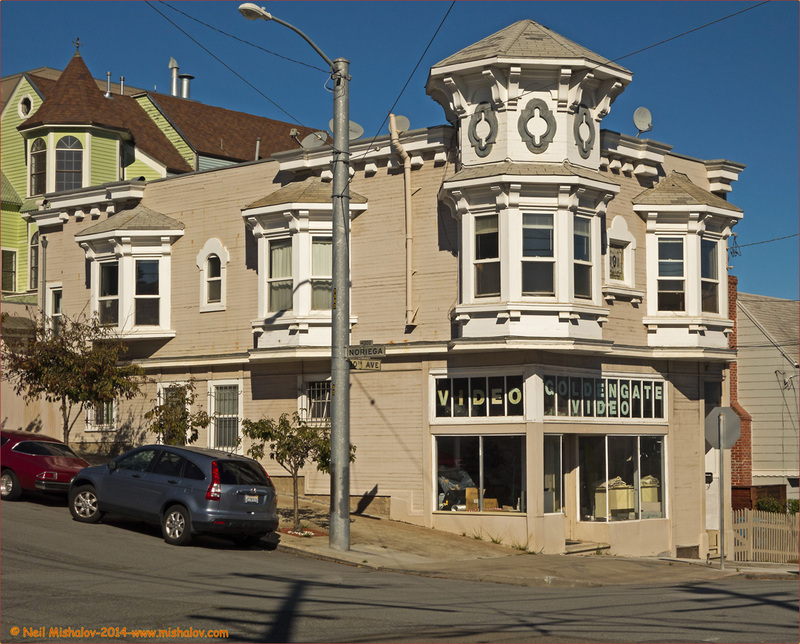 I walked through the lovely Forest Hill neighborhood; I then I ascended Mount Sutro and proceeded to drop down Mount Sutro past the University of California San Francisco Medical Center. Then a quick stop for a bite to eat at Whole Foods in the Haight-Ashbury district. 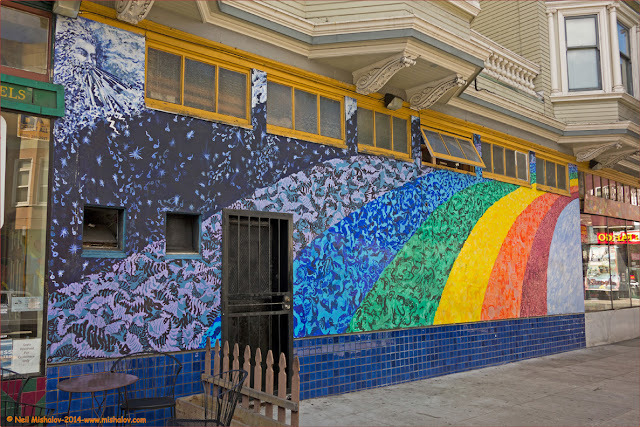 Now satiated, I walked through the Jordan Park neighborhood and then the Laurel Heights neighborhood. 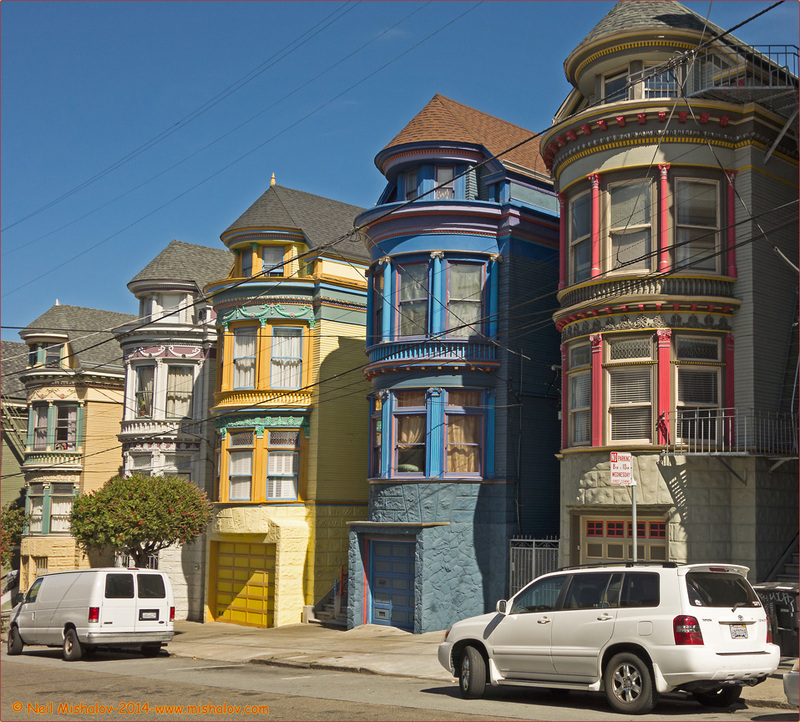 From there, I proceeded to climb Divisadero Street, walking through the Pacific Heights neighborhood. And then, finally, at around 2 pm I dropped down Divisadero Street to the Marina District and the Fleet Week extravaganza which was in progress. By the way, it was twenty-five years ago this week, on 17 October 1989, that the Loma Prieta earthquake struck. 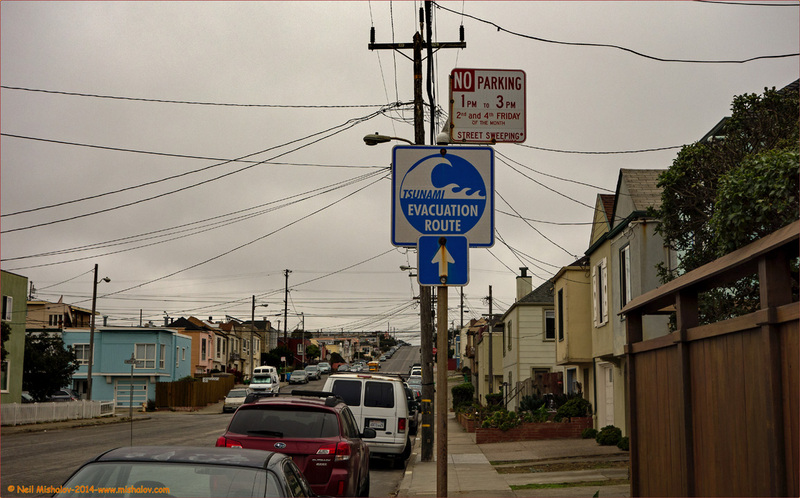 The majority of damage in San Francisco occurred in the Marina District. The map illustrates the route traveled, with mile markers shown. 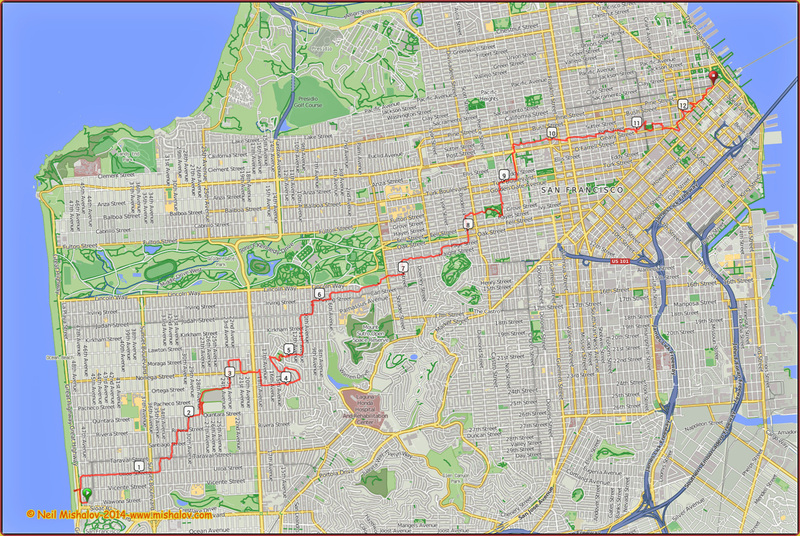 The approximate distance covered, as measured by a GPS receiver, was 11.8 miles. Click on the image to see the full-size photo. A graph of the elevation changes during the ramble. The approximate cumulative elevation gain was 1,372 feet. Click on the image to see the full-size photo. 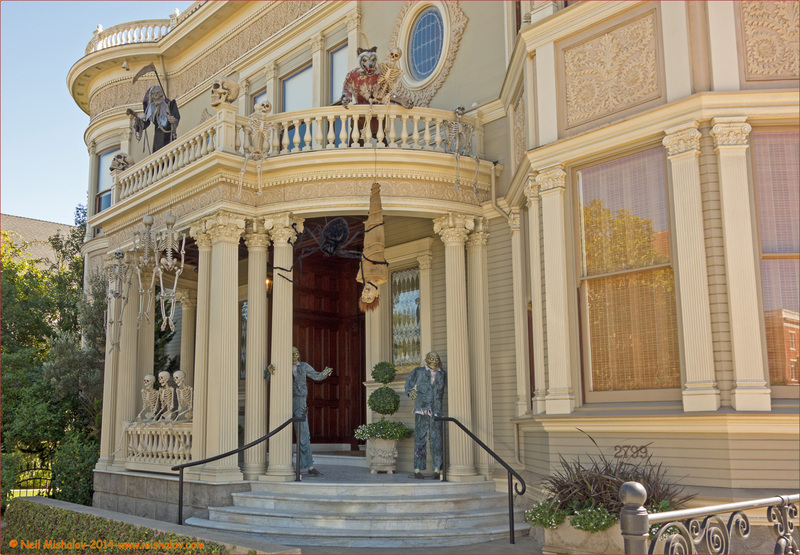 A mansion on Divisadero Street is all ready for the trick or treaters who will be dropping by on Holloween, which is in two weeks. Click on the image to see the full-size photo. This building is located on the northwest corner of the intersection of 10th Avenue and Noriega Street.Click on the image to see the full-size photo. A view from Mount Sutro. 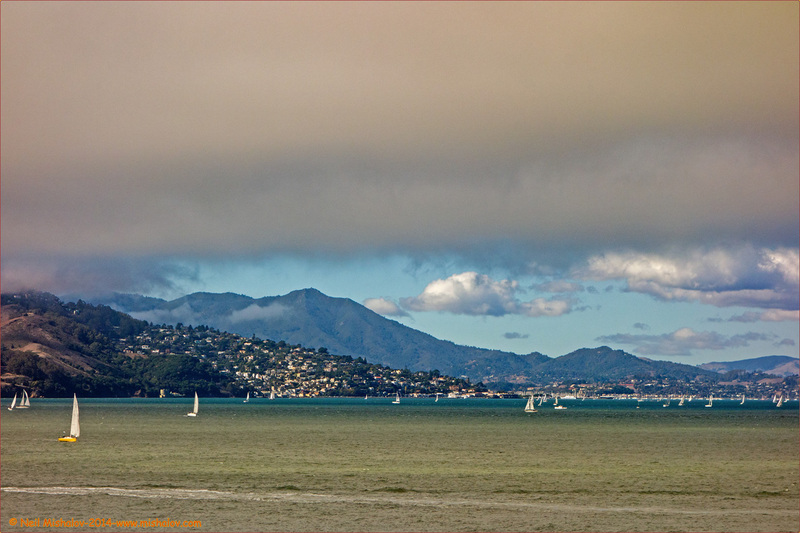 The two towers of the Golden Gate Bridge are visible. 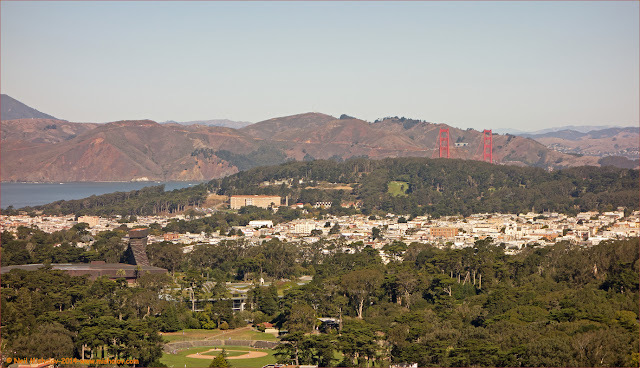 The hills on the north side of the Golden Gate Bridge are a part of the glorious Marin Headlands. Click on the image to see the full-size photo. 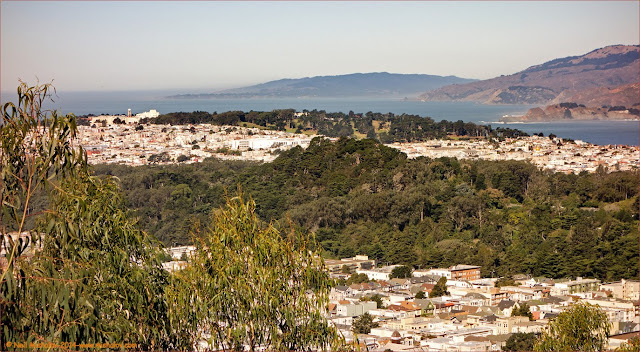 Another view from Mount Sutro. The treed area in the middle of the photograph is Golden Gate Park. 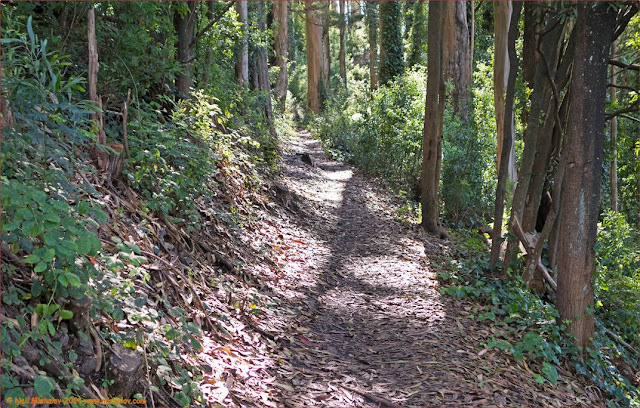 The treed area at the northwestern part of San Francisco is Lands End Park. Click on the image to see the full-size photo. Rambling along the West Ridge Trail in Mount Sutro Forest. Click on the image to see the full-size photo. I am now at the Marina. The Patriots Jet Team was the air display taking place when I arrived.Click on the image to see the full-size photo. 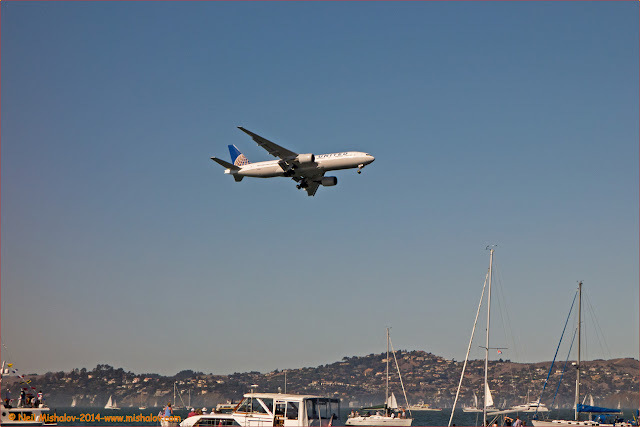 A United Airlines Boeing 777 made several loops around San Francisco Bay in the area just north of San Francisco. A beautiful sight to see Click on the image to see the full-size photo. The United Airlines Boeing 777 coming by for another pass, with the Marin Headlands in the background and the iconic Golden Gate Bridge completing the picture. Click on the image to see the full-size photo. 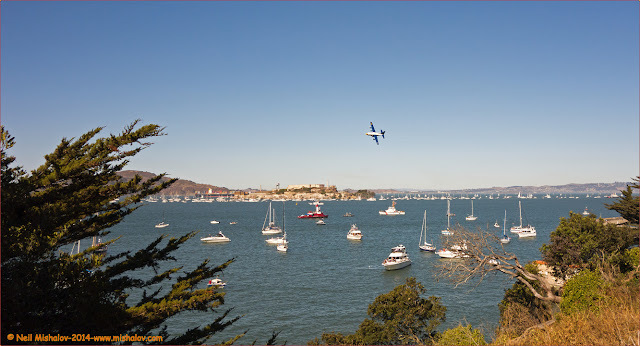 Just before the Blue Angels made their appearance, “Fat Albert,” a Marine Corps C-130 cargo plane which is a component of the Blue Angels support team, did a few fly-bys. Click on the image to see the full-size photo. Then, finally, the main event took place. 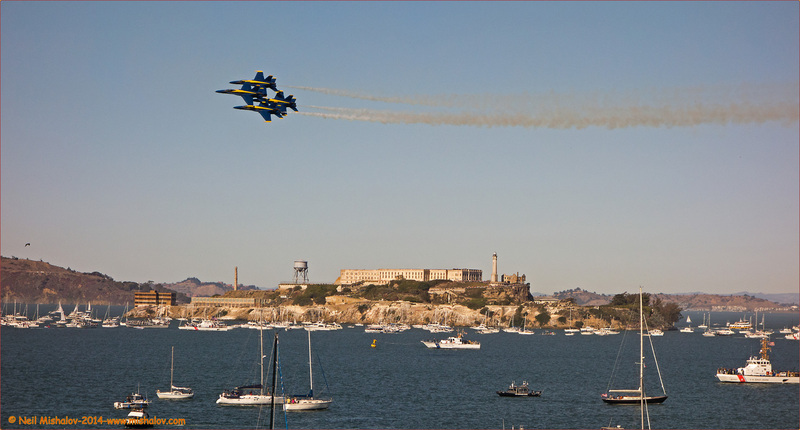 The Blue Angels flying in close, very close, formation in front of Alcatraz Island. Click on the image to see the full-size photo. 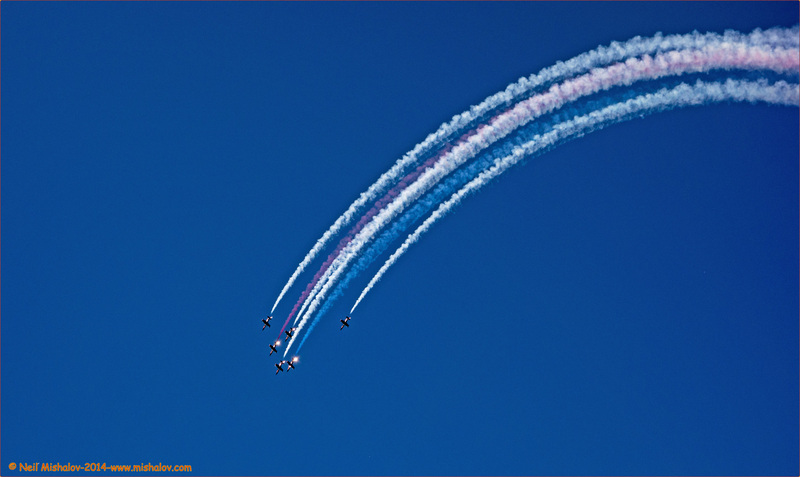 The Blue Angels. Note the four Coast Guard vessels and the cleared channel in the Bay over which the jets fly. Click on the image to see the full-size photo. 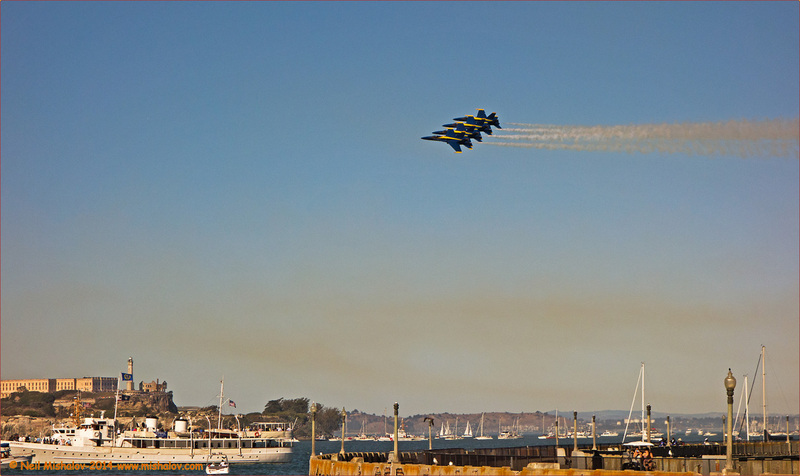 The Blue Angels performed for about one-half hour. Click on the image to see the full-size photo. 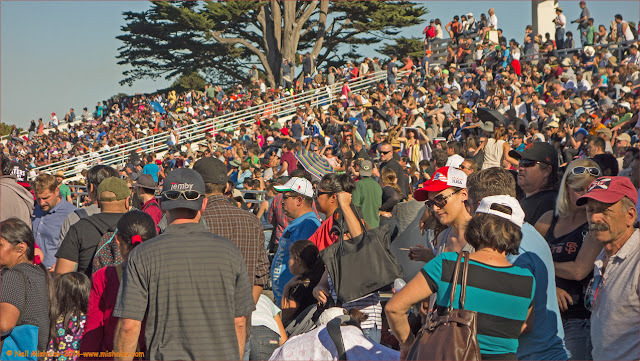 It seemed to me that there were a gazillion people at Fleet Week. Ok, well, that may be an exaggeration… but not by much. The bay shore was jammed with people for a distance of at least four miles. Click on the image to see the full-size photo. 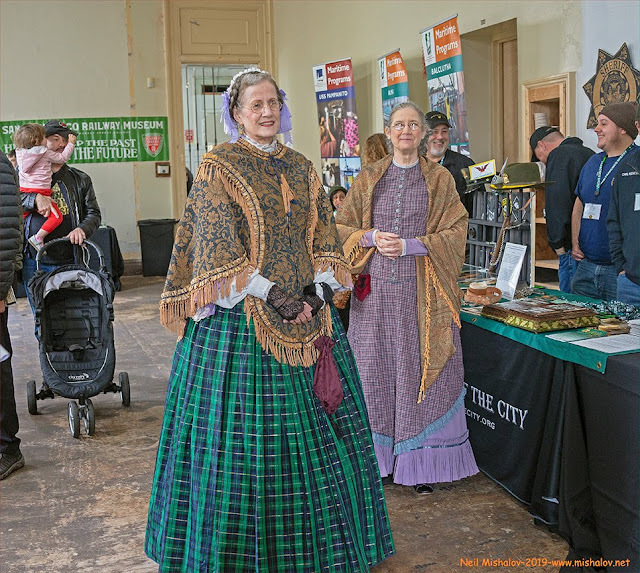 It was a happy, festive crowd enjoying themselves in the delightful weather. Click on the image to see the full-size photo. 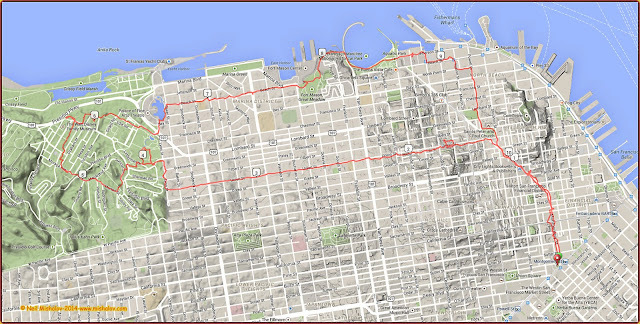 This ramble bisects the City of San Francisco. 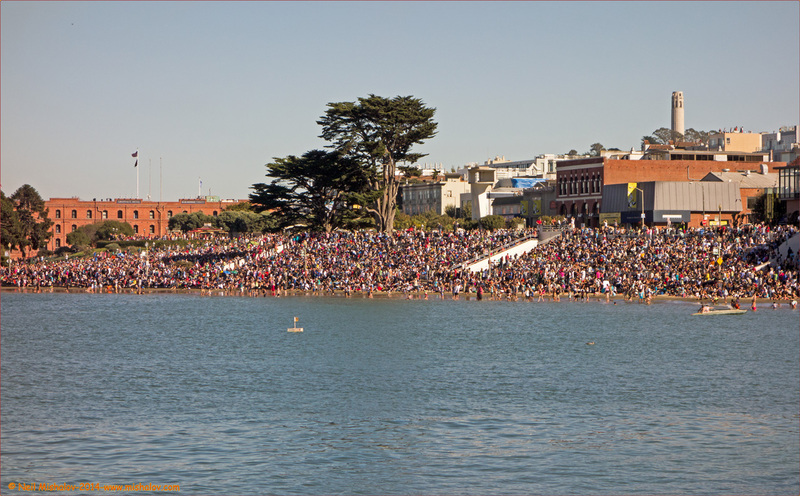 The walk started at Ocean Beach, in the Southwest area of The City, and the walk ended at the Ferry Building in the Northeast area of The City. The route. 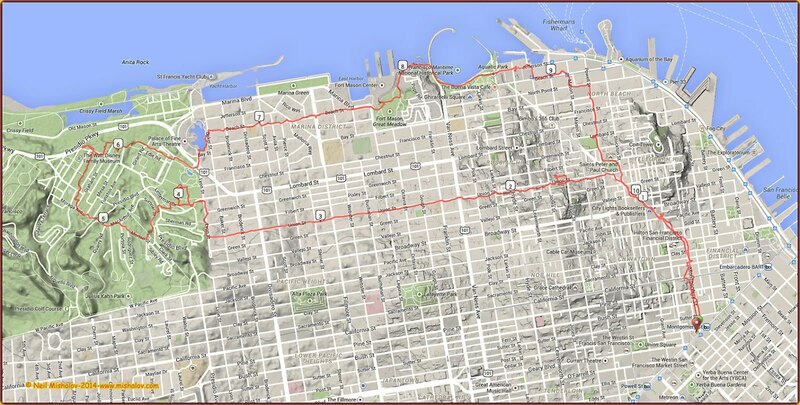 The approximate distance covered, as measured by a GPS receiver was 12.6 miles. Click on the image to see the full-size map. A graph of the elevation changes encountered during the ramble. The approximate cumulative elevation gain was 1,347 feet. Click on the image to see the full-size chart. I used public transportation to arrive at the start of the walk. This is an L-Taraval Muni Metro light rail train. Click on the image to see the full-size photograph. 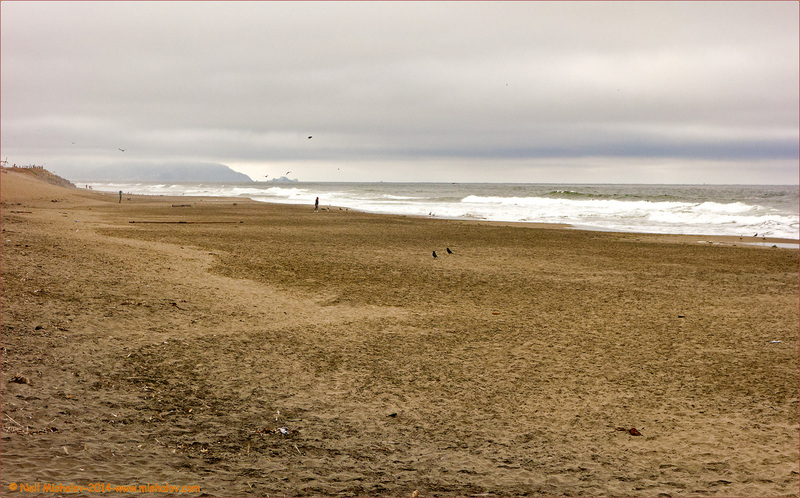 After exiting the Muni Metro, it was a one block walk to Ocean Beach. This view is looking southwest. The beach is lovely, but it is a beach that has taken many lives. The water is cold year round. The most dangerous part of the beach are the rip currents. Click on the image to see the full-size photograph. This location is no more than 100 yards from the ocean. If there is a major earthquake, get thee up to the top of the hill asap. Click on the image to see the full-size photo. 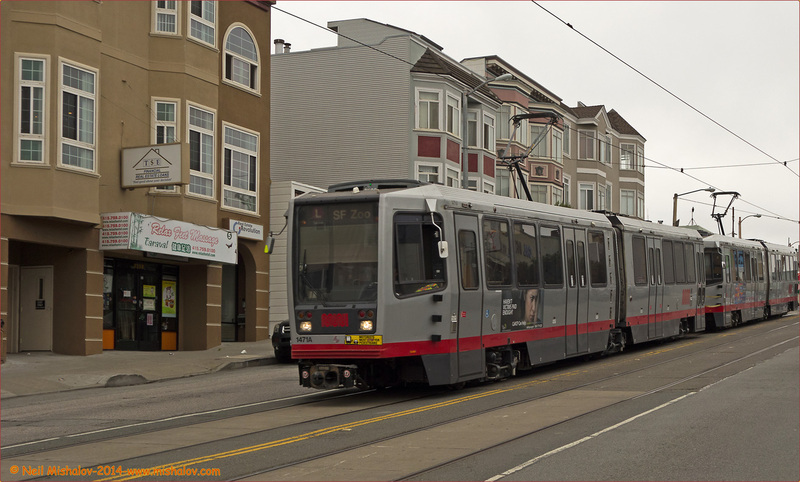 A two-car L-Taraval Metro Muni light rail train is heading towards the ocean. Click on the image to see the full-size photograph. A view looking west. 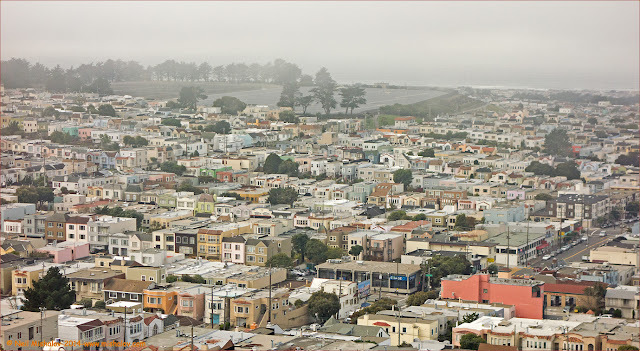 It was taken from Grand View Park which is located in the Inner Sunset District. The large area seen on the upper left portion of the photograph is Sunset Reservoir. It was built in 1960 and has 25,000 solar panels on a portion of the reservoir’s roof. The solar panels were installed in 2010. It is the largest solar installation in San Francisco. Click on the image to see the full-size photo. 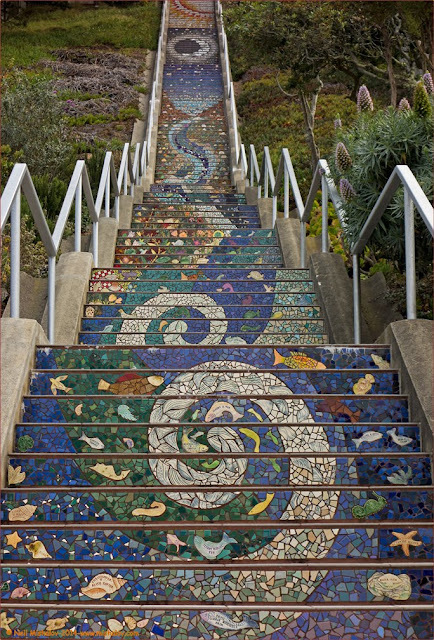 A section of the beautiful Moraga Street and 16th Avenue tiled steps. Click on the image to see the full-size photograph. A view from the top of Grand View Park, looking northeast. Downtown San Francisco can be seen in the distance. Click on the image to see the full-size photo. 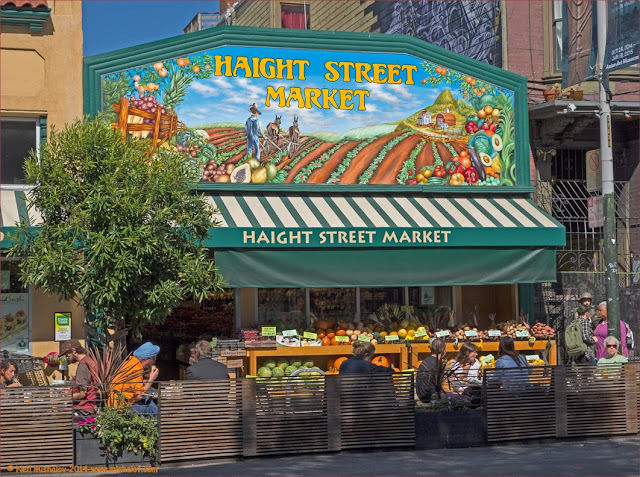 The Haight-Ashbury District of San Francisco came to the apex of its popularity and notoriety, during the Summer of Love in 1967. Click on the image to see the full-size photograph. A house in The Haight. Click on the image to see the full-size photo. An example of street art on Haight Street. Click on the image to see the full-size photograph. A store on Haight Street. Click on the image to see the full-size photo. The southeast corner of the intersection of Haight Street and Ashbury Street. Click on the image to see the full-size photograph. 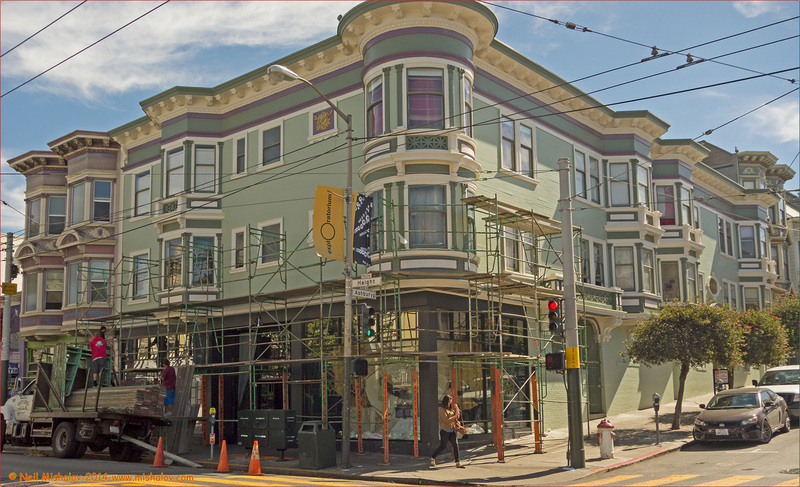 The southeast corner of the intersection of Haight Street and Masonic Avenue. Click on the image to see the full-size photo. Houses in the Haight-Ashbury district. Click on the image to see the full-size photograph. A view of Kezar Stadium while some minor renovations are taking place. The original stadium was constructed in 1925 and was demolished in 1989. 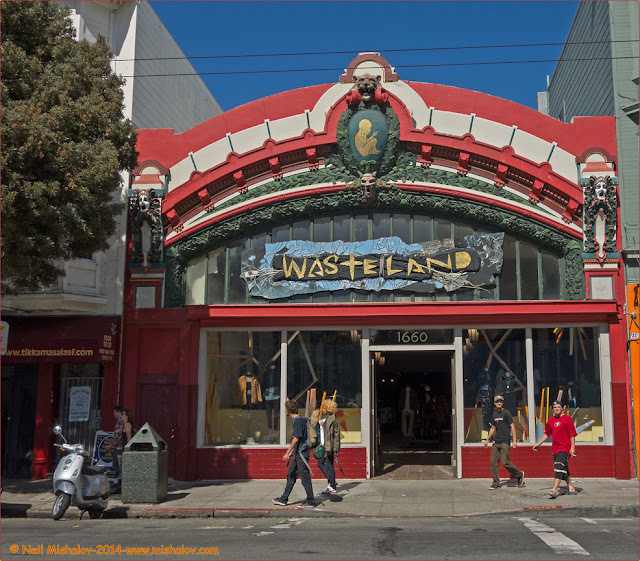 The original stadium was the first home of the San Francisco 49ers football team. Click on the image to see the full-size photo. 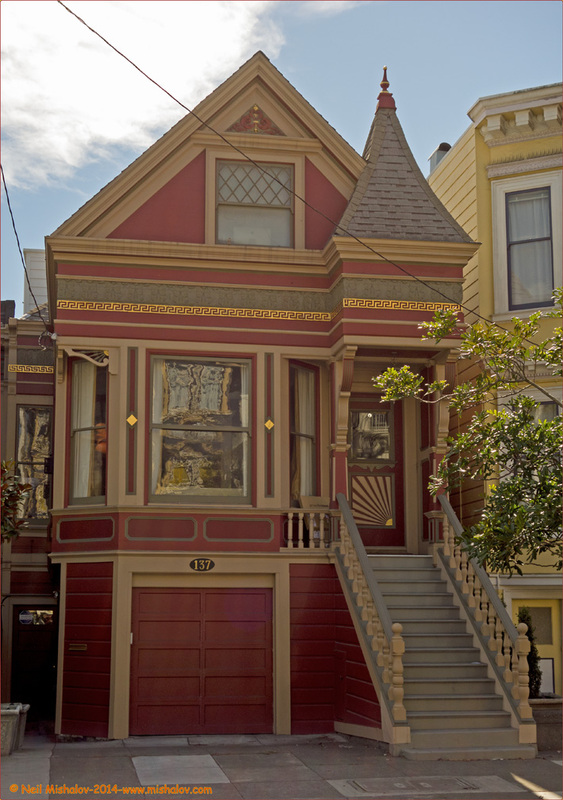 A house in the Western Addition District. Click on the image to see the full-size photograph. This photo was taken from Alamo Square Park, and it shows a well-known scene, sometimes known as “Postcard Row.” These “Painted Ladies” were built between 1892 and 1896. Click on the image to see the full-size photograph. 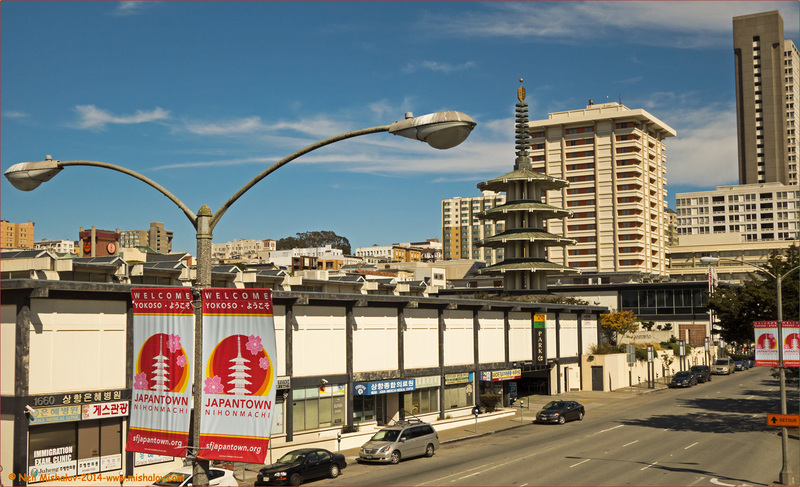 Japantown. Click on the image to see the full-size photo. “A camera is a tool for learning how to see without a camera.”-Dorothea Lange.